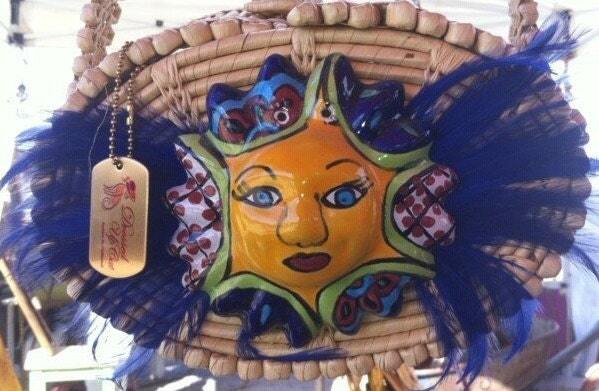 Woven straw structured oval straw shoulder bag with bold blue and yellow sun face in a nest of blue feathers. Detachable name tag. 9” x 6” x 4”. Shoulder strap drop 16”. Who DOESN"T like a romp in the sun? Especially when winter is just getting underway. This bright sun will see you through until warmer weather comes! I started this project purely for my own amusement, but it took on a life of its own. I distinctly remember the first time a total stranger said to me “I LOVE that bag—where did you get it?” My handbags have since been sold in boutiques, art galleries, craft shops and art fairs. They are great for starting a conversation in a room full of strangers. I continue to be fascinated by a handbag’s innate ability to unite women across age, geographic and cultural boundaries.